Cambridge House of Maryville, a BMA affordable assisted living community, will host a health presentation on Oct. 16. The community in the St. Louis Metro East area serves seniors of all incomes, including those on Medicaid. Cambridge House of Maryville, a BMA affordable assisted living community, is hosting a health presentation on the benefits of adding fresh fruits to your daily diet. The presentation will take place from 2 p.m. to 3 p.m. on Oct. 16. The community, which is located at 6960 State Rte. 162 in Maryville, Illinois, serves older adults of all incomes, including those on Medicaid, who need some help to maintain their independence. Marie Boehme, the dietary manager at Lebanon Health Care Center, will be the guest speaker. Afterward, guests are invited to stay for a few games of bingo with residents. For more information, call 618-288-2211. 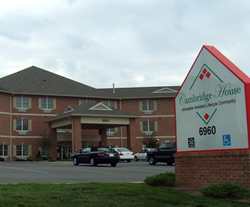 Cambridge House of Maryville is one of three Cambridge House affordable assisted living communities in the St. Louis Metro East area. The other communities are located in O'Fallon and Swansea. All three communities operate through the Illinois Supportive Living program and are managed by BMA Management, Ltd., the largest provider of assisted living in Illinois. The communities combine residential apartment-home living with the availability of personal assistance, help with medications, and a variety of convenience and support services. Residents live in private apartments that they furnish and decorate to their taste. Each of the one-bedroom and two-bedroom floor plans include a kitchenette, spacious bathroom with shower and grab bars, individually-controlled heating and air conditioning, and emergency alert system. "Residents also benefit from all of the opportunities that are available to socialize with friends and neighbors and to participate in activities and special programs," says Tammy Loman, Director of Marketing at Cambridge House. BMA Management, the company that manages all three Cambridge House affordable assisted living communities, is based in Bradley, Illinois. "Our focus," says Rod Burkett, President and CEO of BMA, "is to provide residents with the love, compassion and dignity they deserve and the help and assistance they need. Our emphasis is on helping residents achieve and maintain as much independence as possible for as long as possible." Communities managed by BMA include the Prairie Living affordable assisted living community in Carbondale and the Heritage Woods affordable assisted living communities in Benton, Centralia, Flora, McLeansboro and Mt. Vernon, Illinois. For more information about BMA Management; the assisted living, senior living and memory care communities that BMA operates; and the company's management, development and consulting services, visit http://www.bma-mgmt.com or call 1-877-882-1495 toll-free.